Grill Me in Caulfield has all your burger needs covered, from basics to one-of-a-kind combinations. 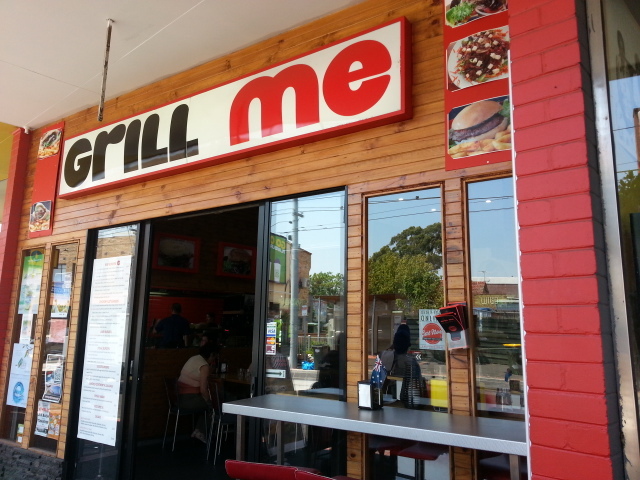 Despite being such a small shop, just off the Glen Huntly Road shopping strip, Grill Me has an extensive menu. 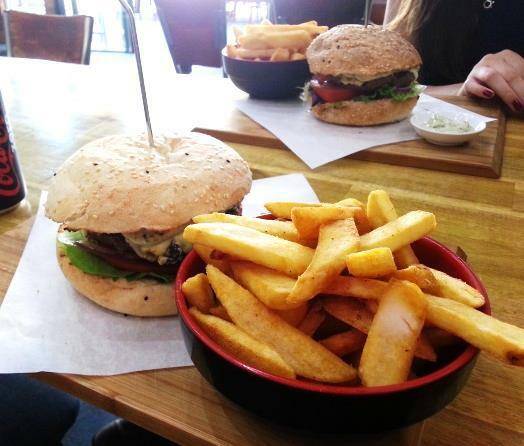 While it is not a chain, it is quite similar to franchises Grill'd and Burger Edge. Following in the footsteps of their franchise competitors, Grill Me serves filling burgers which are fresh rather than greasy, alongside perfectly seasoned crunchy chips. Burger and chips from Grill Me. I ordered the basic beef burger, which cost $8.50 and consisted of a beef patty with lettuce, tomato, a touch of red onion, and creamy herb aioli. The burger was colossal in size. Neither I nor my friend were able to finish our burgers, let alone the chips, which was a pity since both the burger and chips were delicious. As far as menu options go, the basic beef is the most pedestrian choice. 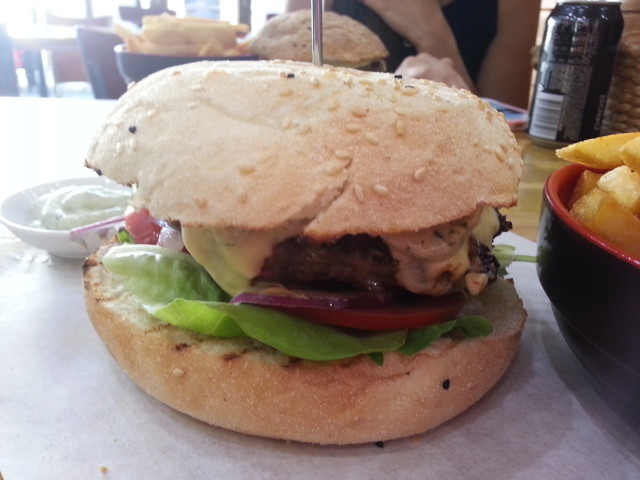 They offer an assortment of burgers with a middle eastern twist. As well as the usual chicken and beef burger choices you would expect from a burger joint, they also have lamb, steak, and veggie burgers, with most costing $10 to $12. 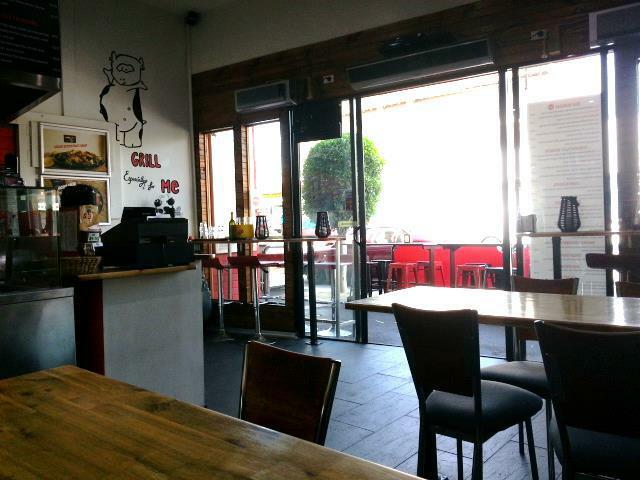 Grill Me is located on Hawthorn Road, Caulfield. Service was excellent. The lady behind the counter was incredibly friendly and patient, and gave us an estimate of how long it would take before our food was ready. They didn't make the burgers quite as quickly as some other burger shops do, but the wait was well worth it. 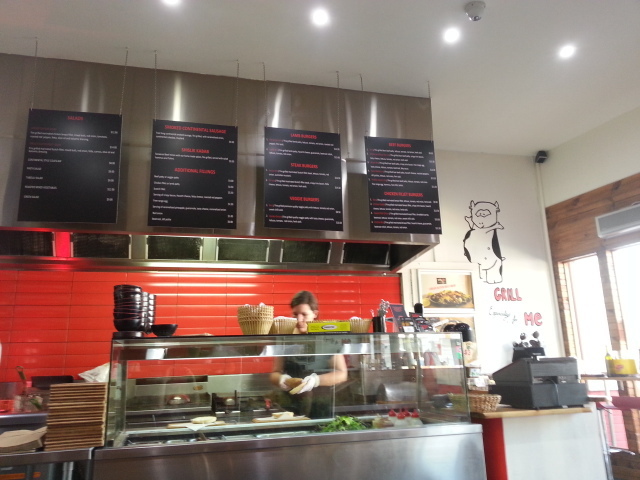 Interior of Grill Me, Caulfield. Why? For unique burgers that you won't find anywhere else in Melbourne. When: 11:30am - 9:15pm daily. Where: 357 Hawthorn Road, Caulfield 3162. Cost: About $10 for a burger and $4.50 for a medium serve of chips.